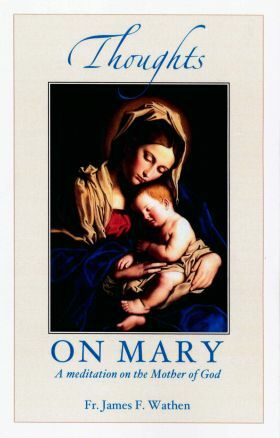 To a virgin espoused to a man whose name was Joseph, of the house of David: and the virgin’s name was Mary. Who having heard, was troubled at his saying and thought with herself what manner of salutation this should be. Behold thou shalt conceive in thy womb and shalt bring forth a son: and thou shalt call his name Jesus. He shall be great and shall be called the Son of the Most High. And the Lord God shall give unto him the throne of David his father: and he shall reign in the house of Jacob for ever. And the angel answering, said to her: The Holy Ghost shall come upon thee and the power of the Most High shall overshadow thee. And therefore also the Holy which shall be born of thee shall be called the Son of God. And behold, thy cousin Elizabeth, she also hath conceived a son in her old age: and this is the sixth month with her that is called barren. And Mary said: Behold the handmaid of the Lord: be it done to me according to thy word. Thus simply and, at the same time, astonishingly is the world introduced to Mary, the mother of Our Blessed Lord and Savior. With this brief conversation, her life takes an unexpected turn; she is commandeered by the Almighty for the all-holy assignment of becoming the mother of His Son.